As Hay’et Tahrir al-Sham captures towns in north Syria, residents fear group’s presence may lead to government assault. 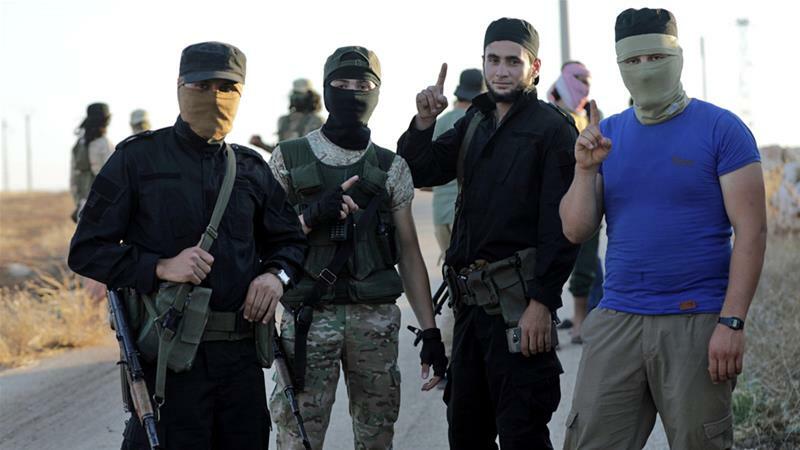 HTS took over Hashem’s town on Sunday as it continued its expansion campaign from Idlib – which it already dominates – into surrounding areas held by Turkey-backed groups of the National Liberation Front (NLF). The group’s aim is to acquire more territory so it has a stronger hand to play as Russia and Turkey prepare a final political agreement over Syria’s last rebel-held enclave, which sprawls across Idlib, parts of Aleppo, and a sliver of neighbouring Hama provinces. Whatever settlement is reached will almost certainly demand the containment and elimination of the armed group. According to the Sochi agreement, signed by Russia, Turkey and Iran last September, Ankara is already supposed to have started reining in the group. Instead, undeterred, HTS is making inroads into strategic areas such as Atareb. The town is near Syria’s main northwest highways, M4 and M5, which connect major cities within Syria and the country itself to her neighbour Turkey. Whoever controls these highways is likely to have a say in any end-game. HTS has succeeded in becoming militarily the most powerful group in the enclave. However, it is opposed not only by all external forces with an interest in Syria but also by many ordinary residents. It has been accused of executing members of moderate rebel groups, kidnapping civilians to extort money, and shutting down educational institutes, among other crimes. Despite the lack of public support, HTS has managed to keep hold of large swathes of territory and exercised military superiority over the NLF, which has never been as coherent, organised – and fanatic – as HTS, as its component groups bicker over ideology and strategy. Hashem is worried about HTS’s ruthlessness as well as about the excuse their presence offers the Syrian government and the Russians to launch what many residents have long believed to be an impending attack. The Assad government would not stand by as HTS expanded and would act to eliminate it. But bombing HTS’s fighters would also kill innocent civilians. “Now Russia and the regime can attack us because we are terrorists – but we are not terrorists,” he said. He added, those who did not die in the offensive would be labelled traitors by the government and “either be killed or jailed”, he said. HTS timed its rampage well. In December, Turkey repeatedly planned and then called off an attack in Syria’s northeast against the YPG, the Kurdish armed group it regards as a mortal enemy. It has been left twisting and turning in response to a changing American policy towards the Syrian Kurdish fighters, who are tied to the PKK, the Turkey-based guerrilla organisation. US President Donald Trump has promised to withdraw support as he seeks to withdraw American troops, but other US officials have given conflicting signals. Turkish President Recep Tayyip Erdogan may be more focused on his “Kurdish problem” than the intractable problem of dealing with HTS. Some analysts go so far as to suggest he did not want the NLF, whose brigades he is using to confront the Kurds, to lose men and concentration fighting HTS. Others speculate Turkey and Russia may have reached an understanding that territories taken by HTS can be attacked and occupied by the Syrian army, in return for Russia allowing Turkey to do what it wants against the Kurds. Jesus. What a feckin mess. How the hell did the West get involved in all this crap in the Middle East? Was it the yanks? Why don’t we Western countries just all get out of the place and let them or someone else sort it all out because we sure haven’t. All we’ve done is flood Europe and other countries with Muslim refugees who belong in Muslim countries, turn Europe and the US into police states forever on the hunt for terrorists and plots, and created paranoia and invasive examinations at airports around the world. More drama in the House of Commons today after PM Questions…. That will probably surprise few people.